I used the recipe as posted. I attempted to shape my tuiles with a cookie cutter and got well, blobs of tuile. Most were rolled around a narrow dowel style rolling pin. Served with homemade strawberry Ben and Jerry's style ice cream. It's now at the beginning of chart D and going flawlessly, if slowly. The yarn is kettle dyed wool of the andes, in whatever they call this shade of yellow. While it's blocked now, this was taken the night I finished it. 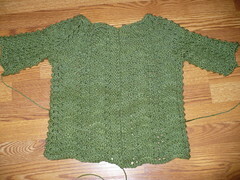 Super quick project and very flattering sweater. I knitted a large, but my gauge is a wee bit tight so this fits well with a bit of negative ease. Yarn is 100Purewool in a fairly accurately represented green from the stash. One of ours is turning 6 in the morning. He's gluten free and largely dairy free and has some fairly significant blood sugar issues (of the please don't feed the boy sugar without protein variety), so I felt befuddled over the morning food issue. He needs to eat quickly after waking, so anything special had to be made tonight. I settled on baked oatmeal using this recipe. While I'd like to say I used gf oats, I didn't. He's trace gluten tolerant, thankfully. (He's gfcf due to autism, not celiac) The two of us still awake both hate oats, but have pronounced this pretty good. I'm hoping that means that oatmeal liking children will love it. I also cooked a rather horrid amount of bacon to serve alongside it in the morning. It's not a breakfast I'd want, but hopefully he'll enjoy it. Tomorrow, I'm making these red velvet cupcakes for the gluten eating members of the family and this one for the birthday boy. I popped a loaf of light wheat artisan bread in 5 minutes a day in the oven tonight. I promptly forgot about it. Around an hour and a half later I remembered...and removed my unappealing brick from the oven. Oops. Reminders to myself: finally get around to trying the infamous NY times chocolate chip cookie at http://www.nytimes.com/2008/07/09/dining/091crex.html. I have these in the oven right now. They smell and look amazing. Only one dirty bowl and maybe 10 minutes of work, although I will allow time to make ganache here in a bit. Homemade laundry detergent is working beautifully so far! Laundry looks and smells clean. I need to go back into the kitchen and start a new batch of half wheat artisan bread in 5 minutes a day. It's my favorite so far. I'm mostly through chart C of Girasole. It's fairly intuitive and going very well. I think it will be perfect to cuddle up under this fall. I also cast on a Porphyria fingerless glove late last night and did the i-cord and got started on the second sleeve of Coraline. I'm finishing up the second Genmaicha glove for Molly. They're just too small for me. Wisp is most of the way done and I have a knitty sock...spring forward? in progress as well. S reorganized all the yarn and knitting. We clearly need to find a stash busting project or three sometime soon. The yarn stash is overtaking the available containers. And yes, blogging again was a new year's resolution. 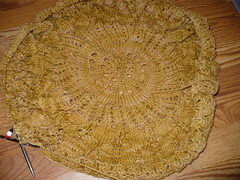 The first knitting project of the new year is Jared Flood's Girasole. Baked today: pumpkin white chocolate chip cookies, mini-quiches for the kids for breakfast, white chocolate rice krispy treats and the light wheat artisan bread in 5 minutes a day recipe.